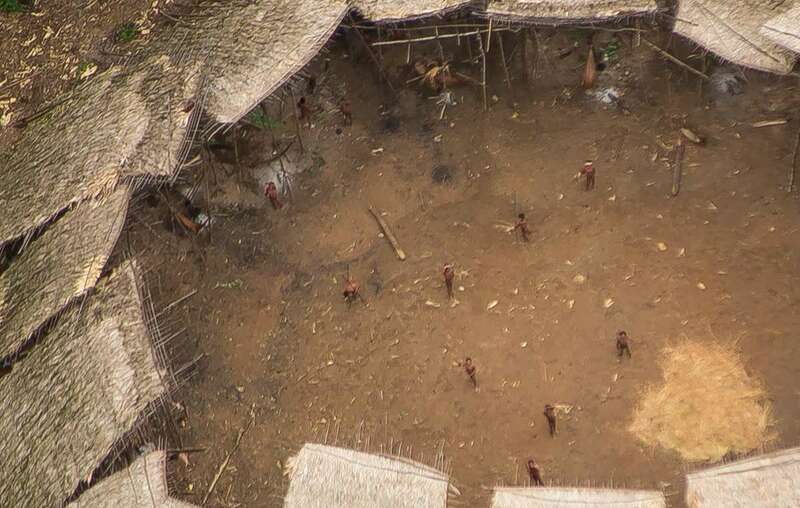 Extraordinary new aerial photos show a contemporary uncontacted tribal community estimated to be home to 100 people in the Amazon. The village is in the Yanomami indigenous territory in the north of Brazil, close to the Venezuelan border. About 22,000 Yanomami live on the Brazilian side of the border, and at least 3 groups of them have no contact with outsiders. They are extremely vulnerable to violence and disease from outsiders. 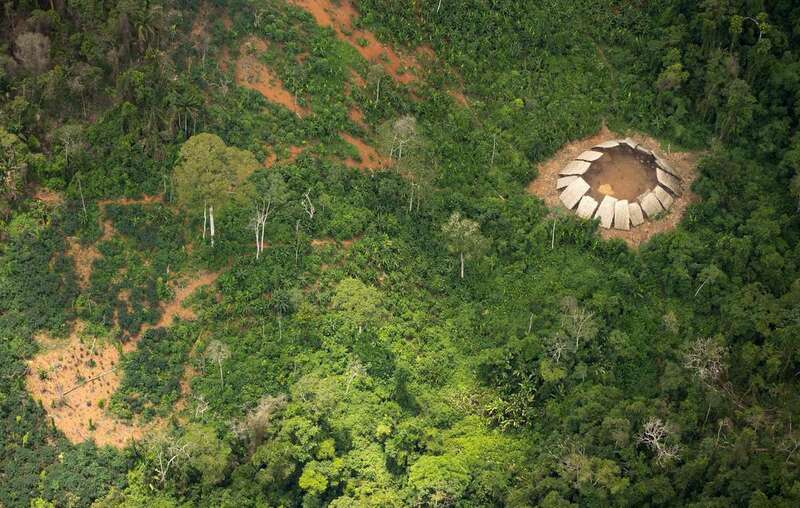 When their land is protected, uncontacted tribes can thrive. However, this area is currently being over-run by over 5,000 illegal gold miners raising serious fears that some of the most vulnerable people on the planet could be wiped out. Uncontacted Indians&apos; yano in the Yanomami indigenous reserve. At least 3 groups of them are known to be uncontacted. Miners have brought diseases like malaria to the region and polluted Yanomami food and water sources with mercury, leading to a serious health crisis. Brazilian government agents are charged with protecting the Yanomami territory. But they are currently facing severe budget cuts amid politicians’ plans to drastically weaken indigenous land protection and rights. Without continued support, the team responsible for the Yanomami region will be unable to protect the territory from invaders, and might even be closed down completely. This would leave the uncontacted Yanomami at risk of annihilation. 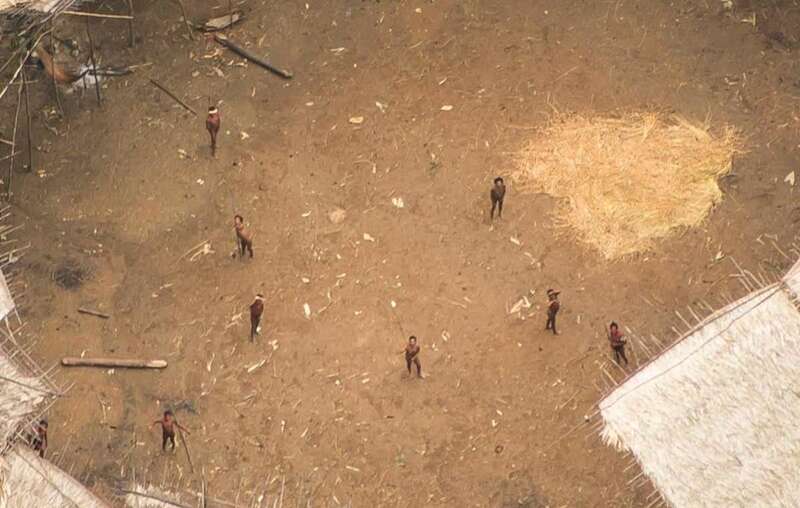 Uncontacted Yanomami Indians photographed from the air near the Venezuelan border. They appear to be in good health, and their population appears to have grown. 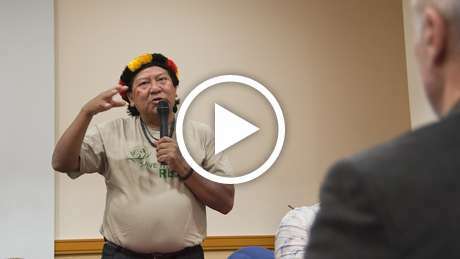 - The Yanomami Indigenous territory was created in 1992 after years of campaigning by Davi Kopenawa Yanomami, Survival International, and the Pro-Yanomami Commission (CCPY). - Before the reserve’s creation the Yanomami were being wiped out by violence from outsiders and by diseases like flu and measles to which they had little resistance, brought to the territory by illegal gold miners and other invaders. The territory has given them the chance to determine their own futures and the tribe has now largely recovered after decades of chaos. - However, FUNAI, the Brazilian Indian Affairs department responsible for protecting territories like this one, is facing severe budget cuts. There are fears that six out of 12 uncontacted tribes teams could be shut down – including the one dedicated to protecting the Yanomami. - Uncontacted Yanomami have clearly indicated their desire to be left alone – fleeing from outsiders and avoiding contacted members of the tribe. - These photos show a typical Yanomami yano, a large communal house for several families. Each of the square sections of the yano is home to a different family, where they hang their hammocks, maintain fires, and keep food stores. 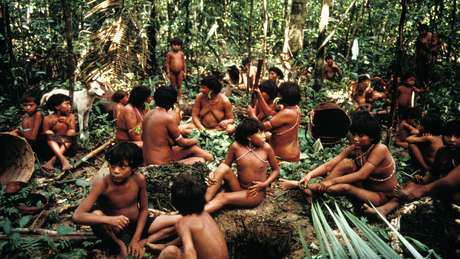 - The Yanomami have a huge botanical knowledge and use about 500 plants for food, medicine, and house building. They provide for themselves partly by hunting, gathering and fishing, but crops such as manioc and bananas are also grown in large gardens cleared from the forest. - Yanomami shamans are the spiritual leaders of their community. They inhale a hallucinogenic snuff called yakoana, which they believe allows them to communicate with the spirit world. 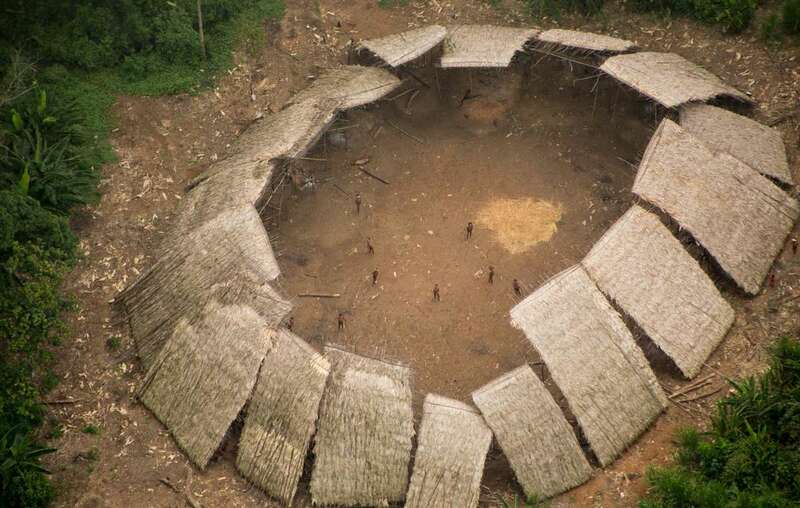 Uncontacted Yanomami seen from the air in the center of their yano, estimated to be home to around 100 individuals. Uncontacted tribes are not backward and primitive relics of a remote past. They are our contemporaries and a vitally important part of humankind’s diversity. Where their rights are respected, they continue to thrive. Their knowledge is irreplaceable and has been developed over thousands of years. They are the best guardians of their environment. And evidence proves that tribal territories are the best barrier to deforestation. Survival International opposes attempts by outsiders to contact them. It’s always fatal and initiating contact must be their choice alone. Those who enter uncontacted tribes’ territories deny them that choice.